October 13th – Game Day! From the Daily Camera … CU continues to gain confidence each week. Off to its best start in 20 years, the Buffs have already exceeded many outside expectations, but realize they’ve done nothing to warrant going into this showdown overconfident. “If we lose this game, people are going to be saying it’s the same old Buffs from last year,” senior safety Nick Fisher said. “We just want to really go in there and play our ball. It’s all about Colorado. That’s what we’re mostly focused on is playing good ball for us. To get to 5-0, the Buffs have played exceptional defense, Montez has been sharp all season, and receiver Laviska Shenault has been one of the brightest stars in college football. What head coach Mike MacIntyre really likes, however, is how this group has approached the season. From the Daily Camera … At 5-0 the Buffs are in control of their own destiny as they near the season’s official midway point, and even a loss in the upcoming back-to-back road games against the Trojans and No. 7 Washington wouldn’t necessarily derail the conference title dreams. Given every other team in the Pac-12 South enters the weekend with either one league loss (USC, Arizona) or two (Utah, ASU, UCLA), it’s not inconceivable the Buffs could lose both road challenges and still play their way into the Pac-12 title game, though they’d need a little help. But CU needs to strive for more. “The Rise” was marred by defeats against each of the top-level opponents the Buffs faced that season, from an early loss at Michigan to the back-to-back blowouts at the end. With the possible exception of a winning-ugly 10-6 victory at Stanford, in 2016 the Buffs defeated every opponent they were supposed to, but not the any of the more formidable foes. USC isn’t the same team as 2016. Freshman quarterback JT Daniels might someday be the next Darnold, but he’s not there yet. The Buffs also aren’t the same team as 2016. With quarterback Steven Montez playing at a much higher level than the green signal-caller that started at the Coliseum two years ago, and Laviska Shenault gathering hype for a Heisman run, and a defense making a habit out of shutting the door after halftime, these Buffs have a chance to be better. Finally toppling one of the big boys would count as a prove-it moment for CU. And even though the silence has spoken volumes so far, the Buffs then could say all they want. 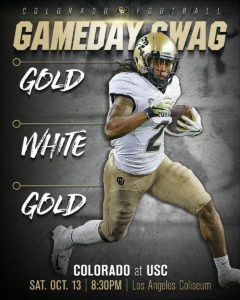 From CUBuffs.com … Saturday night’s Colorado-USC game at the Los Angeles Coliseum will be a rarity in the series. For only the second time since CU joined the Pac-12 in time for the 2011 season, the Buffs are the ranked team (No. 19 AP, No. 18 USA Today), not the Trojans. The first occasion came in 2016, when No. 21 Colorado faced an unranked USC team in the Coliseum — and still came out on the short end of a 21-17 score, one of the 12 times Colorado has fallen to the Trojans in 12 meetings. The 5-0 Buffs aim to end that streak Saturday (8:30 p.m., FS1). But despite their ranking, they enter the game as underdogs. While the 3-2 Trojans struggled early — losing back-to-back games against Stanford and Texas — they seem to have found their footing with wins over Washington State and Arizona. Still, this USC team doesn’t seem to fit the powerhouse mold of the last few seasons. Instead of a Heisman Trophy candidate at quarterback, they have a talented but inexperienced quarterback, true freshman JT Daniels. They have been inconsistent on offense and their defense has not been nearly as dominant as some of their squads in recent years. But the Trojans are still extremely talented on both sides of the ball, and the pattern of Clay Helton’s teams in his tenure has been steady improvement. If the Buffs are to end their all-time 0-12 skid against USC — and Helton’s 18-0 mark in the Coliseum at the same time — they will have to be at their best. Thompson made his first NFL start for the Seahawks on Sunday and made the most of his opportunity. He recorded seven tackles and showcased his play making ability, snagging an interception in the end zone at the end of the second quarter to prevent the Rams from taking a lead into halftime. Thompson also laid an enormous hit on Rams WR Brandin Cooks that dislodged the ball, but was not credited with a forced fumble due to a penalty away from the play. Lindsay gained 100 all-purpose yards for the fourth time this season in the Broncos 34-16 loss to the Jets on Sunday, as he rushed for 61 yards on 12 carries, caught three-of-four targets for 20 yards and took one kickoff return 27 yards. He got off to a hot start, picking up 45 yards on four carries on the Broncos opening drive and while the team turned to the passing game after falling behind, Lindsay was the Broncos leader in carries and rushing yards for the second week in a row. Through five games, the undrafted Denver native leads all rookies in rushing with 328 yards and ranks second (behind Giants RB Saquon Barkley) in yards from scrimmage with 393. From the Daily Camera … KD Nixon sped down the sidelines, reached out and snagged the ball in stride. The 46-yard touchdown catch — during the first quarter of Colorado’s opener on Aug. 31 against Colorado State — looked almost effortless for the 5-foot-8, 185-pound sophomore. It was the first big play of Nixon’s college career, and proved why he could be one of the top weapons for the No. 19-rankd Buffaloes (5-0, 2-0 Pac-12) for years to come. “Football changed my life,” he said. That’s not an exaggeration from the Texas native, who starred at DeSoto High School before coming to CU a year ago as a true freshman. From The Athletic … In​ his first​ film session with his​ new quarterback coach​ last​ spring, Steven Montez​ kept shaking​ his​​ right hand loose. Colorado’s junior QB had never scribbled so many notes, so quickly, and his digits were beginning to feel it. Merely recalling those early days with Kurt Roper this week had Montez pantomiming his note-taking form so rapidly that it looked like a hand cramp could be coming at any moment. Surprising Colorado, 5-0 and ranked 19th in the country, travels to USC (3-2) this week with a chance to take a stranglehold on the Pac-12 South. The Buffs are 2-0 in conference play; the Trojans sit at 1-1. A victory by CU would create a two-game cushion in the South, plus control of the division tiebreaker over the Trojans. The Buffs, of course, have a humbling bit of history standing in their way. Colorado has never beaten USC in 12 tries, and the composite score in those victories for the Trojans is 419-169. But the Buffs are also equipped with something they’ve never had in this matchup: the nation’s most accurate quarterback. From CUBuffs.com … As far as Colorado linebacker Nate Landman is concerned, the math is simple. Landman missed the second half of last week’s 28-21 win over Arizona State after being called for targeting in the first half of the game. Thus, he has some catching up to do Saturday when the Buffs travel to the Los Angeles Coliseum for an 8:30 p.m. meeting with USC (FS1). A game-and-a-half from Landman would be something to see. Despite missing nearly two-thirds of last week’s game (10 minutes in the first half and the entire second half), he still leads the team in tackles (48) and interceptions (2), is second in tackles for loss (5) and is tied for third in third-down stops (5). From the Daily Camera … The college football world is starting to notice Colorado receiver Laviska Shenault. He’s earning player of the week honors. He’s being discussed as a Heisman Trophy candidate. National publications are writing about him. ESPN is in Boulder this week to do a feature segment on him for their College GameDay show. His own quarterback compared him to one of the world’s most dynamic athletes. And, how is Shenault dealing with the attention? The humility of Shenault is nearly as impressive as his performance this season for the 19th-ranked Buffaloes (5-0, 2-0 Pac-12), who will visit Southern California (3-2, 2-1) on Saturday. From CUBuffs.com … Yes, they know. Nobody has to remind the 5-0 Colorado Buffaloes that they are 0-12 all-time against USC. But just in case they had forgotten (they hadn’t), they were asked about it again and again — and again — at Tuesday’s weekly press conference. The Buffs know Colorado has never beaten USC. Yes, the streak is motivation, but they have great respect for the talented Trojans, and when they line up against them Saturday in the Coliseum (8:30 p.m., FS1), they will do their best to end that streak. But here’s another thing the Buffaloes also know: nobody ever lost a game to a record book. History never scored a touchdown or made a tackle — and these aren’t the Buffs who lost to USC last year, or the year before. Different teams, different stakes, different attitudes. Now the Buffs are aiming for a different outcome. They are doing so by going about their business and preparing for the most important game of the year — the next one on their schedule. From ESPN … We know the big names getting Heisman buzz. Tua Tagovailoa is running away with the award early, while Kyler Murray and Will Grier and Dwayne Haskins are all patiently waiting for the Alabama offense to have something approaching a bad game. Even a few long shots such as Trace McSorley, Ed Oliver, Jonathan Taylor and McKenzie Milton have made some noise. But dig a little deeper and there are some off-the-radar candidates who deserve some serious love (and no, we don’t mean Bryce Love). So, nearing the halfway point of the season, here’s a quick look at a few candidates worthy of a lot more Heisman consideration than they’ve gotten. The knock on Shenault is that he has not faced particularly great competition, but the numbers speak for themselves. He’s averaging better than 10 catches a game, which would be the second-highest rate of any receiver in the past six years over a full season. He has topped 125 receiving yards in four of his five games, scored in each and chipped in with another four touchdowns rushing. From the Daily Camera … At times during the 2017 season, Javier Edwards couldn’t get over the feeling that he needed to be making tackles to help the Colorado defense. The problem was that CU didn’t need him to be making those plays. This year, the senior nose tackle is not only leaner and in better shape; he’s also got a greater understanding of his role on the defense and has been one of the best players on that side of the ball for the 19th-ranked Buffs (5-0, 2-0 Pac-12). “Pad level and not being selfish,” Edwards said recently when asked about the difference in his game this season. “Last year, I would stand straight up and try to look in the backfield to make a play. What I realized is it’s not about me. That’s not my job. 1. He’s an avid largemouth bass fisherman. He tries to go in-season when he can and will try to bring teammates along with him (previous fellow fishermen: running back Beau Bisharat, tight end Brady Russell and outside linebacker Nick Edridge). 2. He knows his way around a kitchen. His favorite meal to make is steak, mashed potatoes and eggs. And for dessert, he’ll make a homemade pumpkin pie (with vanilla ice cream on the side). 4. He played high school rugby during his senior year, following in the steps of his father Shaun, who played internationally. 5. Landman is always the last one to run onto the field during pregame. It’s a tradition he has kept since high school, when he began doing it with a teammate to honor one of his former Pop Warner coaches who had passed away (the two held a jersey with the coach’s name on it). “We ran out last, so now I just always run out last,” Landman. From CUBuffs.com … When the 5-0 Colorado Buffaloes’ season began, two of the biggest question marks may have been the offensive and defensive lines. In Saturday’s 28-21 win over Arizona State, the men in the trenches answered those questions by turning in what may have been their best overall performances of the year. The 19th-ranked Buffs (No. 18 USA Today) would like to keep that trend going Saturday when they travel to Los Angeles for an 8:30 p.m. meeting with Pac-12 South rival Southern California (FS1). Against the Sun Devils, the CU offensive line kept quarterback Steven Montez upright all day by not giving up a single sack, while also consistently opening holes for a run game that produced 166 yards and two touchdowns. Defensively, the Buffs’ big men up front gave up just 120 yards to ASU star running back Eno Benjamin — including a scant 24 yards in the second half — to go along with a pair of sacks. But perhaps most importantly, both groups also provided game-defining possessions. Press release from CUBuffs.com … The Colorado at Washington football game on Saturday, October 20 will kickoff at 1:30 p.m. Mountain (12:30 p.m. Pacific) and will be televised nationally on FOX. It is the first half of a doubleheader on FOX; Oregon at Washington State follows at 5:30 p.m. MDT. From The Athletic … Colorado’s all-time leading rusher, Phillip Lindsay, may have relocated from Boulder to Denver, but he’s still had a hand in the Buffs’ first 5-0 start in 20 years. Last winter, when Virginia Tech graduate transfer Travon McMillian was looking for a new home, he sent a DM to Lindsay to inquire about Colorado. They subsequently talked on the phone, at which point an excited Lindsay placed a late-night call to his former coach, Mike MacIntyre, to tell him how much he’d talked up the Buffs. As of that moment, however, MacIntyre had no idea who McMillian was. The ex-Hokie, who’d seen his carries decrease each season, had noticed Colorado might need a new running back to replace Lindsay. Though QB Steven Montez and national receiving leader Laviska Shenault Jr. are the faces of Colorado’s resurgence, McMillian played a key role in the Buffs’ 28-21 win against Arizona State on Saturday. After CU took over up seven midway through the fourth quarter, McMillian, who finished the day with 30 carries for 136 yards, ran the ball seven times for 32 yards and picked up two first downs as he and his offensive line salted away the last 7:10 of the game. From CUBuffs.com … Mike MacIntyre‘s Colorado Buffaloes are not only 5-0 and ranked in the top 20 in the nation (No. 19 AP, No. 18 USA Today) — they are also doing what good teams should do: improve on a weekly basis. Saturday’s 28-21 win over Arizona State in front of a jam-packed Folsom Field crowd (52,681) was the Buffs’ best overall effort yet against the best team the Buffs have faced so far. Colorado’s offense once again came up with big plays and punishing drives, the defense delivered key stops when most needed — including a huge goal-line stand — and special teams were consistent. This is not a team that appears content to rest on its laurels. But now the road only gets tougher — literally and figuratively. CU next faces perhaps its toughest stretch of the season, as the Buffs travel to Los Angeles on Saturday for a pivotal Pac-12 South showdown with USC (8:30 p.m., FS1), followed by an Oct. 20 visit to seventh-ranked Washington. So what did we learn from Saturday’s win over the Sun Devils? 1. Colorado’s coaching staff has pushed all the right buttons. From MacIntyre on down, the CU staff has done a stellar job in preparing their players mentally and physically, as well as developing game plans that have put the Buffs in position to make game-changing plays. But it is more than just Xs and Os. CU’s coaches have found a way to make sure a blend of veterans and young players have developed a strong chemistry — not always an easy task — and have kept the Buffs motivated while helping develop a unique personality. As MacIntyre noted after Saturday’s game, this is a group that has found a way to stay “loose” and enjoy the moment but still remain focused on the task at hand. The importance of that chemistry can’t be overstated. From CUBuffs.com … Sophomore linebacker Jacob Callier has undergone shoulder surgery, and is lost for the season. Callier played in 11 games last fall as a true freshman, and started against Colorado State and UCLA. Since Callier played in only four games this fall, he won’t lose a season, and will use 2018 as a red-shirt season. Sophomore defensive back Mekhi Blackmon, who also saw action in the first four games, will take advantage of the new red-shirt rule, and will sit out the remainder of the campaign. By only playing in four games, Blackmon will not lose his red-shirt year, and will still have four years to play three at Colorado. From CUBuffs.com … It has become as reliable of a connection as sunrises and the east: Montez to Shenault. Once again, Colorado’s dynamic combination of quarterback Steven Montez and wide receiver Laviska Shenault Jr. proved unstoppable. Saturday afternoon, the two Colorado stars connected 13 times for 127 yards and two touchdowns in a 28-21 win over Arizona State. Shenault is quickly rising in the ranks of Heisman Trophy favorites, as well as other national awards. In five games, he has 51 receptions for 708 yards and six touchdowns, including a 3-yard scoring reception and a 30-yard scoring reception against the Sun Devils. He also has four rushing touchdowns, including two Saturday. Neither could the Sun Devils contain Montez, who is also a candidate for a host of national awards. The CU junior has completed 115 of his 153 attempts for 1,420 yards and 11 touchdowns, and has been so accurate that his 72.7 percent completion rate Saturday — 24-for-33 — actually dropped his season percentage to 75.2. The connection was certainly on target Saturday. The two hooked up on big play after big play, producing six first downs — including some key third-down plays that kept scoring drives alive — to go along with the two touchdowns. From the Daily Camera … Colorado battled past Arizona State, 28-21, on Saturday to remain the only undefeated team in the conference. The Buffs also insist they’ll remain focused. Over the next two weeks, the Buffs will take aim at the top. USC is the defending Pac-12 champion and can seize control of the South by beating the Buffs. On Oct. 20, CU will visit No. 7 Washington (5-1, 3-0). “They’re going to be huge games,” quarterback Steven Montez said. “USC and Washington are two very good teams that are playing very well right now. We just have to approach it exactly how we’ve been approaching it all year. We’re going to come in Sunday, watch the film, kind of flush this game out of our system and then on Monday we’re right back to work and we’re scheming for USC. This post, about the USC game, from the 2018 Season, is filed under Article. “I THINK he has a CHANCE to be a star……”? what does Montez have t do to be a star in these dweeb’s eyes? Complete 100 percent of his passes? Another good player profile. Nice learning about K.D. Totally. And another timely reminder of that is that Rae carruth is being released from jail. A friend and fellow alum said there is a series being done on that story. Crazy one, for sure. Thinking back to the Nebraska game and all of the stuff that Coach McCartney said about why he chose Nebraska as the game that the Buffs would point to (all those years ago), it’s obvious to me that this should now be USC. Whether Buff fans think of USC as a “rival” and regardless of what USC players and coaches thinks about CU, this is the game that CU players should be pointing to. It would be great to beat both USC and UCLA in the same year and be the champions of LA. Called the Gold Rush uni.